A new Black Sabbath book is now available. 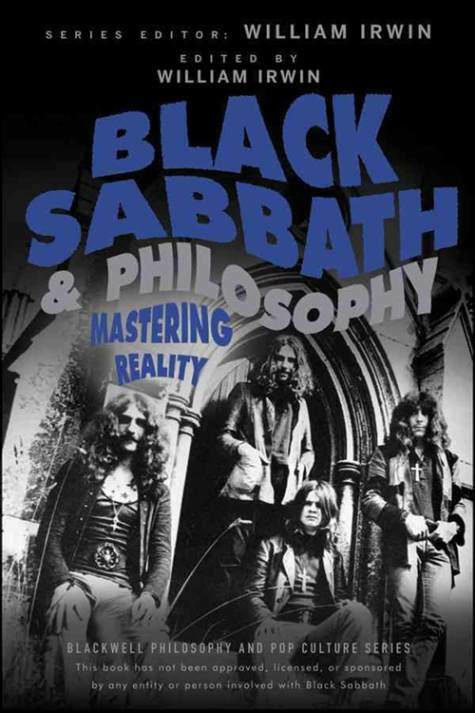 "Black Sabbath And Philosophy: Mastering Reality" - a philosophical look at heavy metal's dark masters of reality, Black Sabbath - has just been published worldwide via The Blackwell Philosophy And Pop Culture Series. One of the world's most influential and enduring rock bands, Black Sabbath helped to define a genre with classic songs like "Paranoid", "Iron Man", and "War Pigs", songs whose lyrics reveal hidden depth and philosophical insight. Their songs confront existential despair, social instability, political corruption, the horrors of war, and the nature of evil. This new book explores the wide range of profound ideas in the band's music and lyrics as never before. It discusses and debates essential Black Sabbath topics and themes, such as the problem of evil, "War Pigs" and the nature of just war theory, whether or not Sabbath is still Sabbath without Ozzy, and whether "evil is in the ear of the beholder"
Irwin is professor of philosophy at King's College in Pennsylvania. He originated the philosophy and popular culture genre of books with "Seinfeld And Philosophy" in 1999. Irwin has also co-edited "The Simpsons and Philosophy" and edited "The Matrix And Philosophy" and "Metallica And Philosophy". He is currently the general editor of The Blackwell Philosophy And Pop Culture Series.